Stevia is a product that I was already well aware of actually. Many years ago when my grandpa was diagnosed with diabetes right before Thanksgiving, I headed off to my health food store....privately owned by a couple who I swear knew practically everything about every herb, spice, tree, plant, vitamin, mineral, nutrition, body issue, whatever out there (and if they didn't, they'd consult every resource they had), and who refused to carry anything in the store that they didn't support or wouldn't use themselves. Moving on past the really long, run-on sentences to make the story a bit shorter, one of the things I was introduced to was Stevia. It's an all-natural, insanely sweet sugar substitute. Stevia in its raw forms comes herbs and shrubs in the sunflower family and has up to 300 times the sweetness of common table sugar that you probably use. I was certainly skeptical when I first tried it. I was raised to be dead set against sugar substitues like Sweet 'N' Low and Equal that so many dieters use and considering both my Mom and I found we were sensitive to some of the funky chemicals they use in place of sugar nowadays, it was all the more reason to not ever want to use them. Stevia was another story, though, and when I baked with it the first time, I was shocked that it didn't have any negative effect on how the food turned out. Seeing as how my grandpa is very old-fashioned and would roll his eyes at my grandma's use of Sweet 'N' Low, he too was shocked when my "sugar-free" items served that Thanksgiving, didn't taste sugar-free at all! Since then, I've moved many times (far away from my beloved health food store) and long ago lost the need for spending money on stevia to sweeten foods for someone else's dietary needs. I was happy to see that the FDA finally approved Stevia a few years ago (it's been used since at least the 1800s), but even more excited to see that the "dietary supplement" I was sent to try out, was actually 3 different forms of stevia! What you'll see on store shelves now is generally going to be Truvia and Fructevia. Fructevia is a natural blend of fructose, FOS (extracted from artichokes), stevia, and magnesium carbonate (a natural mineral used to keep it from caking) and is about 2x as sweet as sugar, so when I tried it out, I was able to use half as much in my recipes without losing any sweetness. It's available in both large bags for cooking, and also little packets that are great for sweetening drinks on the go. 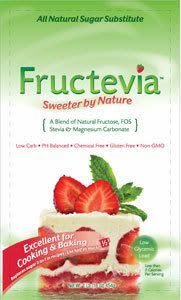 Fructose doesn't affect blood sugar levels like refined sugar does, so Fructevia is safe for both diabetes I and II sufferers, along with low-carb and low-glycemic dieters, and those suffering from hypoglycemia. Steviva (the brand of stevia I tried) guarantees that it'll taste just like the sugar you're used to, too! Don't tell anyone, but as soon as I opened the bag, I licked a finger and stuck it in. If I was going to be reviewing it, then it better taste like sugar, ya know!? Shockingly, it tasted just like powdered sugar (the granules are a bit smaller than table sugar). My next biggest concern was that when it came to baking, if I was only using half as much, then wasn't it going to throw off the consistency and texture? I baked a loaf of bread with it, though, and it turned out just like it always does, though, so happily, no effect there! I also used it a couple times in various drinks and they tasted great. Price-wise, it's definitely more expensive than sugar and I have no intentions of switching over to just using it because I'd go broke! lol On that same note, though, if you're someone who uses artificial sweeteners, buying this is probably going to cut your bill down instead. The tiny 1.3 oz (8 oz. by volume) bottle of Steviva stevia powder (no fillers) they sent me contains 370 servings. Holy cow, lol. They are running some *huge* sales right now, though, so if you're even slightly interested (or already use it), be sure to check out the main site. There are some "super duper" specials where you can get a couple different products for a pretty hefty discount and then have it shipped for free even! 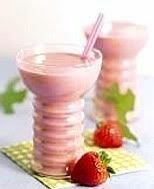 You can get more information about the various products and blends they offer, and about stevia itself, along with a section of recipes to try out. Anywho, I think I've said more than my fair share.....I already approve of stevia products and Steviva's blends seem to be really good. If you have any questions, feel free to ask them and I'll do my best to answer. I have quite a bit of the product samples left (did I mention 370 servings in a tiny bottle?? lol), so I'll keep trying it in different recipes and update this if I have anything more to say. I'm still kind of nervous about trying it in a batch of something like cookies that seem to rely more on the texture of sugar, but they're on my list to try! I haven't tried stevia, I use xylitol instead. It looks and tastes like sugar but it doesn't feed candida - which is a big plus for me. You can't use it for yeast cookery (because it doesn't feed yeast) or for caramelising but it's very nice in natural yoghourt or in coffee. I've read that stevia has an aftertaste - is that true? Nope, no after taste here, fairy. I was reading in the FAQ section that one of the questions was about aftertaste, and it said that in large quantities it's known to have a bit of one. So I guess if you're using a ton of it in something, then it's going to be so overwhelmingly sweet and full of it that it'll end up having a bit of an aftertaste. Nothing I used it in showed even a hint of it, though...it really did taste like I'd used sugar. I used it in a few different dishes that I fed to other people and didn't tell them it was different until 'after', so I could get their opinions before/after, too. I've never used xylitol, though, so maybe I'll have to try that out. It sounds like it's useful to know about.